This workflow assumes you will be shooting RAW images with more than one camera, or processing images from a job shot by more than one photographer and using Lightroom. You need to make sure all of the cameras used are set to the same date and time, before you shoot, and that the cameras are set to number files continuously. Read the camera's manual to see how to change the in-camera naming scheme. If you don't have the manual, bring your cameras in and we might be able to figure it out for you. I'll explain continous file naming below in Step 2. 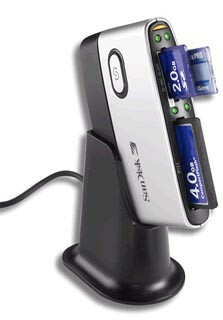 There are many different types of memory cards and card readers, some people plug their cameras directly into the computer and download images that way. As a rule you're probably better off using a card reader, transfer rates tend to be a LOT faster and you'll have less wear and tear on the cameras. Also, using the camera to download images drains the camera's battery. When you place your memory card into the card reader, Lightroom should automatically open and present you with the import dialog box. If not, go to the File menu and select "Import Photos from Device..."
F:\(EOS_DIGITAL) is what my computer names a memory card when I use the card reader, yours will probably be different. 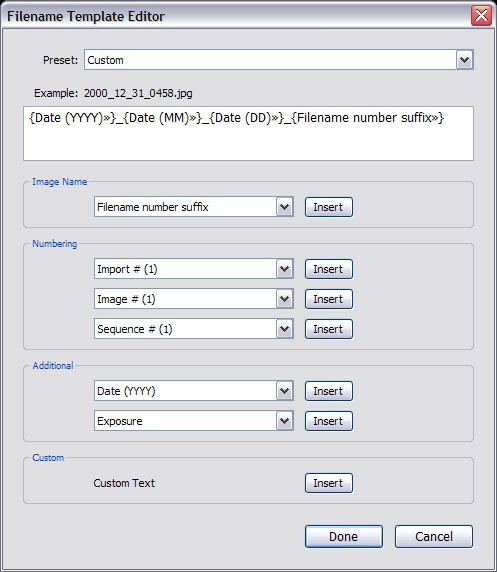 Under "File Handling" choose "Copy photos to new location and import." "Copy to:" should be set somewhere that you'll be able to easily get to, for both Mac and PC the desktop is usually the most convenient place. On my desktop I have a folder called "Images" where I import memory cards. "Organize:" should be set to "Into one folder" this will copy all the images on the memory card to a single folder. Put a check in the box by "Put in subfolder:" and here I've used the name "Card1" for my folder. The file naming template should be "Filename" and the rest of the settings should be set to "None," with "Standard" for the previews option. If you would like to apply keywords to the entire import, you can add them at this stage, or wait until later when you process the images. Selecting "Show Preview" will expand the dialog box to show you which images Lightroom has found on your memory card, and what it will be importing. Repeat this step for each of your memory cards. Be sure to change the name of the subfolder in each import box (card2, card3, etc..). With all the folders selected, press and hold Control (Command on a Mac) and press 'A' this will select all the imported images in those highlighted folders. Under the "View" menu, select "Sort" then "Capture time." This will take all of the images you just imported and sort them by when they were taken. When you've imported all of your images, look for the imported folders under the "Folder" list on the left side of your screen. In this example you can see that card1 had 22 images on it that were imported, and card2 had 8 images. 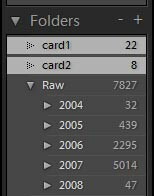 To work with all 30 images at once, we need to highlight both "card1" and "card2," to do that hold down the Control (Ctrl) key (on a PC, or the Command key on a Mac) and use the mouse to click all the folders you imported. Lightroom uses the date and time information given to the files by your camera, so it's important to make sure your cameras are set to the correct time and date, or at least the same time and date. Adjust for daylight savings time also, most cameras don't do this automatically. Now that you've got the image files sorted, it's time to rename them. When dealing with thousands of images (as we tend to do) there is a very good chance that if you keep the camera file name, at some point you'll end up with more than one file with the same name. File name issues come up all the time because photographers don't rename their images. If you use Auto Reset, each time you change (or format) memory cards the camera will start at file IMG_0001.RAW again, which means over time you'll have hundreds of files all called IMG_0001.RAW. This wreaks havoc later if you want to put them in the same folder or use them in the same job. If you set file naming to "Continuous," the camera will keep counting up until you get to file IMG_9999.RAW before it resets to IMG_0001.RAW. Lightroom has a very powerful renaming feature built right in. A wedding photographer who uses multiple digital cameras or works with another photographer would need to use a different naming scheme. If the different cameras file names are in sync, you'll have images with the same name. That's a bad thing. two files with the same name can NOT exist in the same folder. The newest one added will overwrite the older one. That is why I suggested you download each memory card to its own folder. But the above naming scheme using the 4-digit camera file number won't work, so here's an alternative. In Lightroom I've created a second preset called "event preset." this preset uses a 6 digit date (YYMMDD) then has a space for custom text "JO" in the example below, an underscore for readability, and then a number sequence starting at 0001. Leading zeros are important! The rename dialog box below will come up when you select "event preset" under the rename menu. The date will be filled in for you and Lightroom will ask you for the "Custom Text" and the "Start Number" for the sequence. Here I've used a set of initials for the custom text "JO" and I want the sequence to start with number 1. you can see from the date that the image Lightroom grabbed as an example was shot on 080216, that is February 16th, 2008. If you shoot more than one wedding in a day, the custom text is VERY important, it will be another way to distinguish one job from another. The chances of the same photographer photographing two weddings, on the same day, with the same initials, are probably near impossible. If you don't want to take the chance, instead of using initials use "_1" and "_2" for the first and second events respectively. Now we've got our images sorted and renamed, but they're still in those "card" folders. In the image below you can see the "card" folders and my "year, month, day" folder structure. 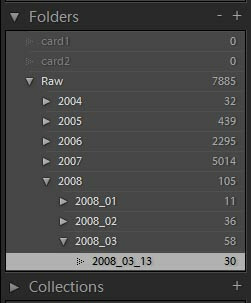 The 30 images in the two card folders were shot on March 13th, 2008. 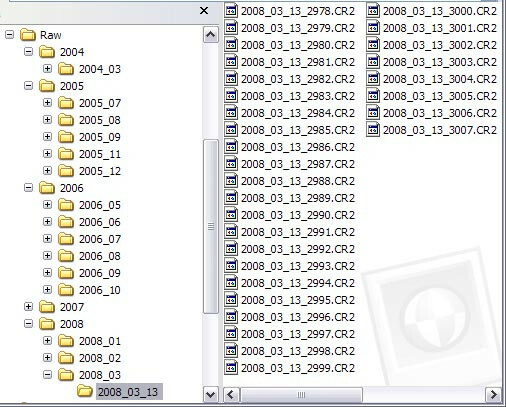 As you can see in the left list, there is no folder for March '08, so we need to create one. 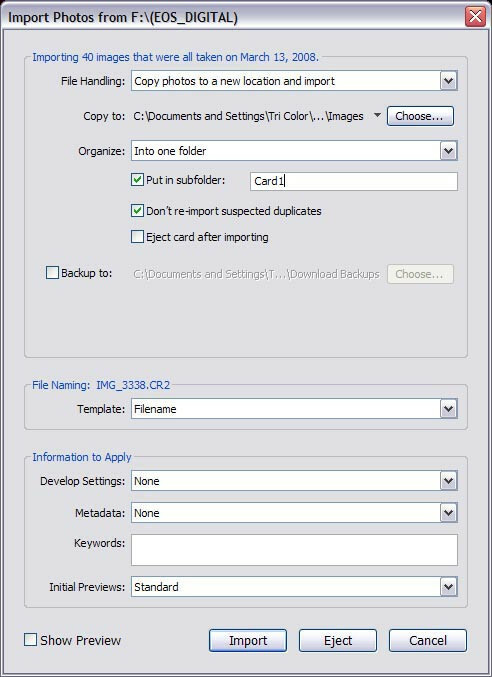 Highlight "2008" and then press the plus sign to the right of the word "Folders," this brings up the "Create Folder" dialog box, type in: 2008_03 to create a folder for March '08. Next highlight the newly created folder, hit the plus sign again to create another folder, call this one 2008_03_13. Recall that to work with all 30 images at once, we need to highlight both "card1" and "card2," so, hold down the Control key (or the Command key on a Mac) and use the mouse to click the folders. Once the folders are selected, all the images in them are available, so select all the images with Control A (Command A on the Mac). Click and hold the mouse button on one of the images and drag it to the 2008_03_13 folder, and lightroom should start moving the images to that folder. NOTE: If you imported images from different days, for example you shot on Friday and Saturday, create a folder for each day and copy the images to the appropriate folder. 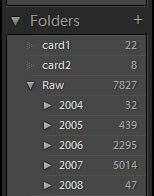 Now you can see that all 30 images are in the "2008_03_13" folder, and there are none in the "card" folders. With the images safely moved you can right click on the "card" folders (or Control-click on the one button Macs) and delete each one. Don't forget to go to your desktop and delete the "card" folders from the "Images" directory also. Now you're all set to import your next job. 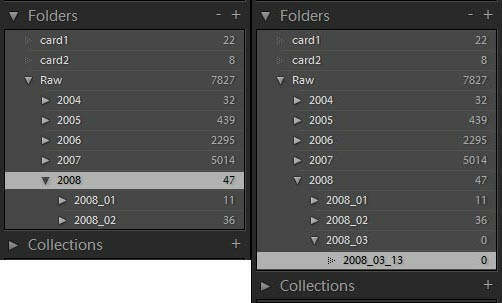 In the image below you can see a directory listing of the folder where the images in Lightroom are actually stored (here they're on a network RAID) and you can see that the 30 images have been moved from the desktop to the storage folder we have set up.